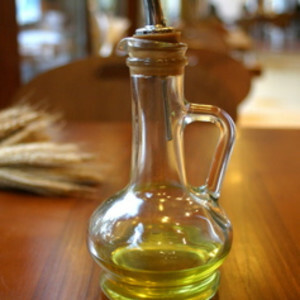 Prized in kitchens throughout the world, olive oil is a product extracted from pressed, tree-ripened olives. All olive oils are graded by the degree of acidity they contain, and extra virgin, with less than 1% acid, is considered to be the finest. It's also the fruitiest, as it comes from the first, or cold pressing of the olives, a heat- and chemical-free process that produces optimal nutritional value, flavor and color. Extra virgin olive oil can range in color from light champagne to bright green, but in general, the darker the color, the more intense the olive flavor. Olive oils come from all over the world, but Spain, Italy, Greece and Portugal are the top producers. Most of the domestic olive oils in the U.S. come from California. The flavor, color and aroma of these oils may vary greatly depending on the growing region. Though extra virgin is the most expensive, its uses in the kitchen are deliciously endless. It pays to experiment with different brands or grades until you find your favorite. Store olive oil in a cool, dark place for up to six months. It can also be refrigerated for up to one year. Cold olive oil becomes thick and cloudy, but it will return to normal when brought back down to room temperature. Extra virgin olive oil is best suited for low- to medium-heat cooking and uncooked applications like marinades, salad dressings and free-style drizzling. Stick to lower quality oils for frying. Extra virgin tends to break down at higher temperatures. Drizzle extra virgin on crusty bread or open-faced sandwiches. Brush it onto cooked vegetables, fish or meats right before serving. Add it to baked or mashed potatoes instead of butter. Olive oil is a monounsaturated fat that can help reduce levels of LDL (bad cholesterol) and improve levels of HDL (good cholesterol).